There seems to be an emerging trend for testing mail delivery drones. 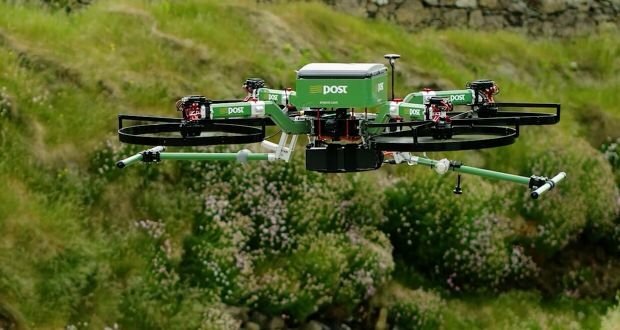 Following in the footsteps of SwissPost and Posti, SingPost announced today that they had successfully completed a last mile mail and packet drone delivery trial between Lorong Halus and Pulau Ubin. The customized quadcopter flew a distance of 2.3 km (1.4 mi) over Serangoon Harbour in Singapore. Its payload? A letter and a T-shirt. Although this might seem mild in comparison to SwissPost’s 1 kg (2.2 lb) or Posti’s 3 kg (6.6 lb) payload capacities, what really sets SingPost’s trial apart is the fact that it also tested a prototype app designed with very specific security and verification features in mind. As SignPost highlights, none of the other mail delivery drone trials from this year featured “point-to-point, recipient-authenticated” deliveries or an app that will allow customers to select their preferred time and date for delivery. No specific date has been given as to when the service will be commercially available. However, the testing does underscore SignPost’s aim to become a leading e-commerce logistics provider in the region. Establishment of a wide-ranging commercial drone delivery network would help the company not only compensate for the global decline of mail volume but also improve mail delivery in the heavily congested urban environment of Singapore. As the test flight over water demonstrated, commercial drone deliveries might also be a game changer to other Asian countries (such as Indonesia) where large clusters of populated small islands pose a significant hurdle to package delivery today. Customized version of the commercially available Pixhawk Steadidrone. Only parcels under 0.5 kg (1.1 lb). A 2.3 kilometers (1.4 miles) route over Serangoon Harbour at a maximum height of 45 meters (148 feet). Not specified, however the press release does indicate total flight time was 5 minutes. Thus, assuming the 2.3 kilometer (1.4 miles) route is only one way, this would mean flight speed was roughly ~27.6 km/hr (~17 mph). What are your thoughts on this new mail delivery drone trial? Comment below!